Cherry Mobile refuses to be a sitting duck amidst all the fireworks and hoopla of stellar quad core Android releases by its rival companies. CM has taken arms and its counterattack has come in the form of Cherry Mobile SkyFire 2.0. If you remember, a couple of months back, the local handset giant unveiled Cherry Mobile Flame 2.0, a quad core Android smartphone priced at only Php 6,999. It was an amazing release - especially when you consider its low price tag - but it was met with criticism from a lot of CM fans online. According to them, the phone would have totally slayed its competitors had it come with a far bigger battery, a camera with back-illuminated sensor, and a scratch resistant touchscreen. Well, from the looks of it, Cherry Mobile SkyFire 2.0 aims to address and correct most of the weaknesses of its fellow quad core handset in CM's current line-up. Priced at Php 7,999 - that's a thousand bucks more expensive than Cherry Mobile Flame 2.0 - the freshly unveiled smartphone comes replete with a 5-inch qHD display protected by scratch-resistant glass touchscreen, 1.2 GHz Snapdragon S4 Quad-Core Processor running Android 4.1 Jelly Bean OS, 1 GB of RAM, 4 GB of internal storage expandable via microSD card slot, an 8 MegaPixel main camera with LED flash paired with another 2 MegaPixel shooter in front, WiFi, Bluetooth and 3G connectivity support, and a rather sizable 2,000 mAh battery pack. As of writing, we're still waiting for a review unit so we can check if both cameras come with BIS technology. 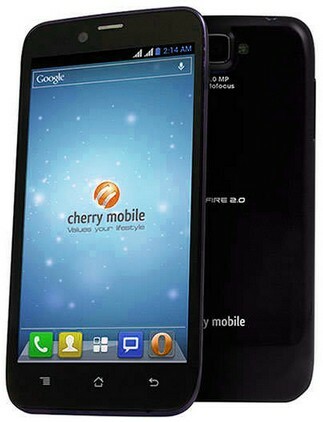 Cherry Mobile SkyFire 2.0 entered the market last week coming face to face with two terrifying Quad Core powered competitors in the form of MyPhone A919i and the ultra-popular O+ 8.15 -- albeit O+ isn't really a local handset company and has its eyes set on directly competing with Samsung. Just from looking at the specs sheets, it appears that CM SkyFire 2.0 has the least powerful set of specifications of the trio - though not by much, mind you - but it's also be the most affordable.